Here's round two for an HDTV HTPC (High-Definition Television Home-Theater PC). For the previous round, see my web page of notes on using the FusionHDTVII tuner card. As mentioned in the previous round, the most important consideration for an HTPC is noise. While Shuttle XPCs are quieter than your average PC, they still are noisy, especially for the family room. The noise was enough that my wife continuously asked me to turn it off. So the HTPC was shut off more than it was on, essentially making it useless for time-shifting HDTV programs. Two announcements at MacWorld on January 11, 2005, got me to try again. Elgato added tuning of unencrypted digital cable TV (Clear QAM). This was exactly what I was waiting for since my Over-The-Air (OTA) reception in New Providence, NJ is poor due to the Watchung mountains. The Mac mini annoucement of a quiet computer opened up the possibility of time-shifting HDTV in the family room. I have had good experiences with Elgato Systems products, starting with the EyeTV 200 in April 2004 and the EyeHome in October 2004. The EyeTV 200 is attached to a dual 2GHz Power Mac G5. I've time-shifted hundreds of standard definition (SD) programs, editing and saving many of them to DVD. It takes about 3 minutes to edit the commercials out of a program, and a typical hour show ends up around 45 minutes. Three of these hour shows will fit on a 4.7 GB DVD. I favor using Roxio Toast 6 Titanium over Final Cut Express / DVD Studio Pro for simple program archiving. The silent Eyehome is in the family room, where it is used to view saved TV programs stored on the Power Mac. It's simple enough to use so the remote is still working, i.e., it hasn't yet been thrown with great force. On the day of the annoucement of clear QAM support, I immediately ordered an EyeTV 500. Follow their instructions to upgrade the firmware. After the firmware upgrade the coax input mis-labeled "ANT. OUT" will actually be for cable input (newer units may have fixed this label to CABLE IN). For a while, it was also attached to the Power Mac G5, where it can coexist with the EyeTV 200, thanks to some foresight by Elgato Systems. I had some firewire problems with port on the front of the G5 and on an add-in Adaptec PCI card. These known problems require occasional reboot to fix them. Carefully follow the documentation by Elgato to set up digital cable channel names. The names must exactly match the names used by Titan TV to correctly schedule a recording from the online schedule. The example channel lineup for Comcast of NJ is below. But we want to view HDTV programs on the big HTDV in the family room. I used a 17" PowerBook with a 1GHz G4 to view Superbowl XXXIX on February 6, 2005. The CPU was often pegged and there were occasional CPU overruns that exhibited jerky video where the image would hesitate and speed up, probably with significant frame dropping. It wasn't annoying enough to stop watching. The experience suggested that the Mac mini with its faster 1.42GHz G4 processor could handle the load. The Mac mini arrived on March 3, 2005. Apple's setup wizard for the Mac mini includes support for Bluetooth wireless keyboard and mouse; there's no need to have wired devices at hand just to get started! Setup of the EyeTV 500 was easy as I'd already done it on both the Power Mac and PowerBook. Copying /Library/Preferences/com.elgato.eyetv.plist from one machine to another works so you don't have to re-enter the channel names. HDTV viewing was up in minutes with Mac OS / Mac mini / EyeTV 500 as opposed to hours with Windows XP / Shuttle XPC / FusionHDTVII. I attached an M-Audio Transit for Dolby 5.1 sound. It connects to the Mac via USB and to the home theater receiver using optical TOSlink. 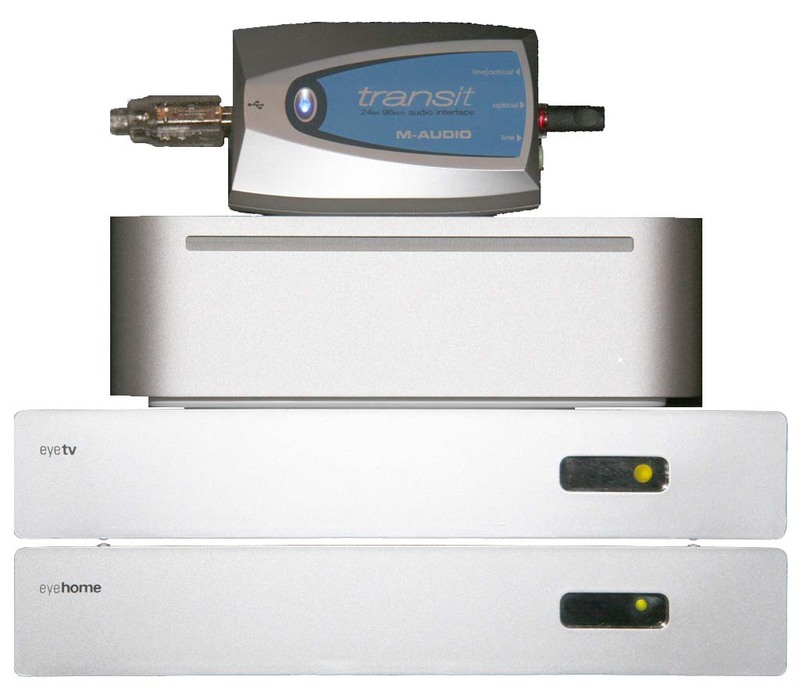 The audio output on the Transit is a dual plug that can take either a standard 3.5mm stereo mini plug or a TOSlink optical cable. The Opti-Glow Optical cable gives a visible indication of connectivity. It took some web browsing and fiddling to configure the M-Audio Transit correctly. System Preferences > M-Audio Transit USB > Settings > Active Channels: Output to AC-3. System Preferences > Sound > Output > Choose a device for sound output - Name/Port: Headphones / Built-in Audio. Do NOT choose M-Audio Transit USB / USB as the device for system sound output, or you will only get stereo output and will not be able to configure your applications for Dolby digital output. Quit EyeTV (DVD Player) and restart EyeTV (DVD Player). Applications like EyeTV (DVD Player) seem to check for digital audio only on startup, so if digital audio was not enabled at startup time, it will continue to be disabled. 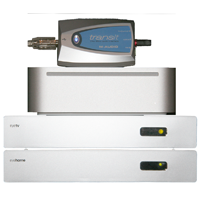 Configure Digital Audio via the menu item Audio > Audio Output > Digital Audio Output. Configure digital audio stream via the menu item Audio > Dolby Digital, or other named stream. The available streams appear by name at the bottom of the Audio menu. The streams may have duplicate or incorrect names, so you should use trial-and-error until you get the best audio for the current program. Make sure to check the M-Audio site for driver updates. With version 1.5.9, audio output from the Transit would stop under high CPU load, and I would have to switch Audio Output to System Sound Output and then back to Digital Audio Output to get it working again. I just updated to version 1.6 of the driver, and digital audio output has not stopped even with the CPU pegged by simultaneous playback of two or even three programs. I've heard a few audio dropouts, but kudos to M-Audio for improved robustness and performance. Q: The EyeTV 500 product requires a "G4 500 MHz or better" processor. Why is that? A: Decoding MPEG-2 video is a very CPU-intensive task. EyeTV will not be able to decode MPEG-2 content in real-time on a slower processor. It takes a dual processor G5 to display full size, full frame rate HDTV. From my experience, a dual 2GHz Power Mac G5 certainly decodes whatever I've seen coming through the EyeTV 500. But how does the Mac mini handle the load? On some programs, I've seen CPU overruns similar to those seen on the 1GHz PowerBook G4. This prompted me to do a more scientific sampling for CPU usage under various program loads. With Activity Monitor running and program Info displayed, I took a photo with my DSLR of each selected channel to record info (video: record channel, call-sign, encoding, width, height, Mbps, fps; audio: encoding, sample rate, kbps) and %CPU (for EyeTV, user, system, idle). I also calculated a first order guess of %CPU / Mbps. High Definition programs are shown in green for 720p and red for 1080i. They are clearly toward the upper end of the graph, requiring a lot of bandwidth and consuming a lot of CPU for decoding. 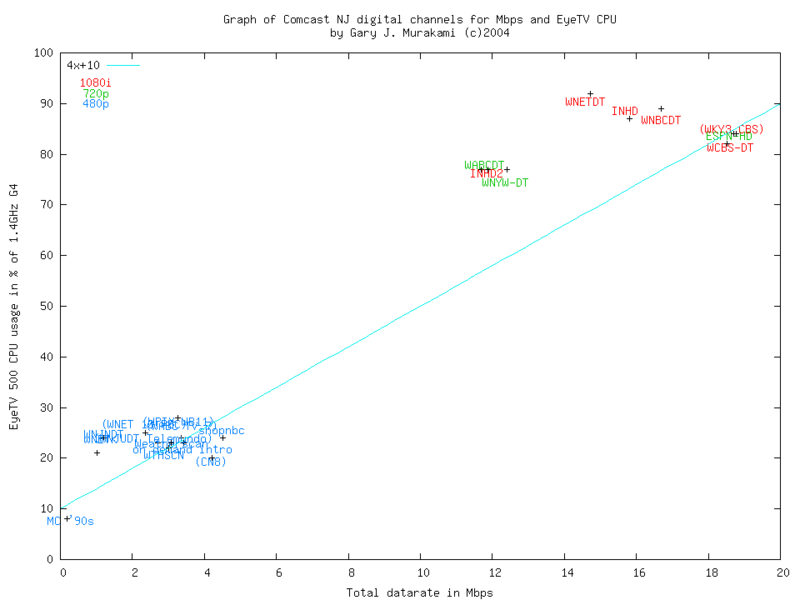 Standard Definition 480p programs are shown in blue, and are clumped around 3Mbps and 25% CPU. The audio-only channel is labeled "MC '90s" (Music Choice '90s) in blue. This is an example of an audio-only channel that doesn't have any motion video, just an occasional background image. For this test, other overhead was WindowServer around 5% and Activity Monitor around 2%. Idle CPU headroom was often in single digits for HD programs. Our visual experience matches the measurements. The Mac mini can easily handle SD and audio-only programs, and it has enough CPU to decode a single HD program almost all of the time without dropping frames. The headroom is small enough that we do get rare visible CPU overruns. Real-time viewing or viewing while recording have similar CPU loads. The program stream must be read from the EyeTV 500 tuner, and this firewire IO has some small but significant cost. In both of these cases, the program stream is written to disk. Real-time viewing writes the program to disk so that you can pause or do instant replay. Program playback has a lower CPU load than recording or real-time viewing. Playback reads the program stream from disk, but doesn't have any firewire IO to the EyeTV 500 tuner. Some applications may have significant load even when idle. Use Activity Monitor to identify non-HDTV applications to quit. Internet Explorer (IE) consumes around 7% CPU just displaying the TitanTV program grid, even when hidden. Unfortunately, the TitanTV site seems to work best with IE; function is incomplete for all of Safari, Firefox/Mozilla/Netscape. Mac mini recognizes 720p HDTV over DVI - screen resolution 1280x720. Does not display full 1280x720 screen - bezel covers edges including menu bar, no adjustments for DVI (and RGB? ).